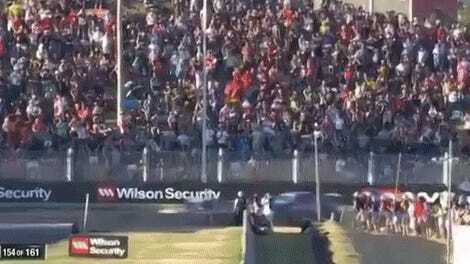 Everything about the current V8-powered Australian Supercars is pretty extreme. The components on the car have to be pretty meaty to handle all the power and the door-to-door banging around these cars do. So, then how does a big fat transaxle linkage just snap in half mid-race?! 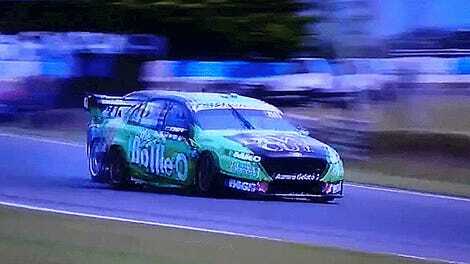 The 2015 Bathurst 1000 winning No. 888 TeamVortex Holden Commodore VF team of Steven Richards and Craig Lowndes suffered one of the most bizarre racing failures I’ve seen in a long time. 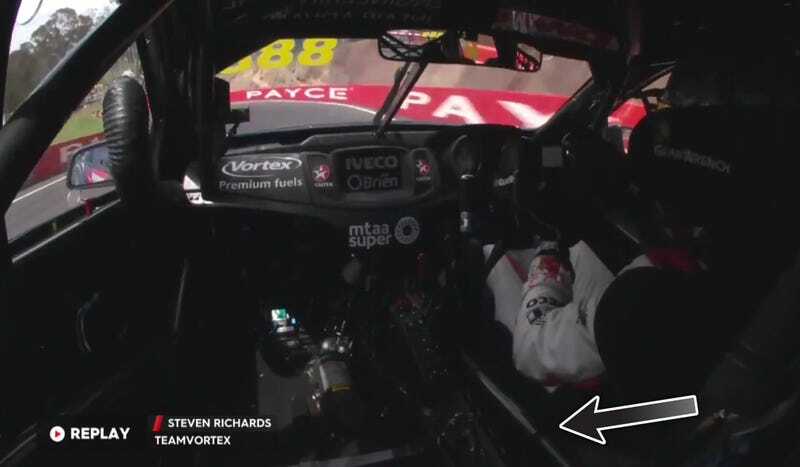 Richards was left with the car stuck in sixth gear on lap 34 of today’s Bathurst 1000 after the transaxle linkage snapped in half. We had no issue or feeling of the problem until it broke, the guys did a pretty good job to get it out. V8 Supercars, like Porsche 944s, have the transmission at the rear end—typically referred to as a transaxle—for better balance. This means there’s a long tube linkage that connects the transaxle to the shift knob itself. This linkage is a stout, meaty thing built to handle a barrage of shifts throughout a race. In all my years of owning a 944, it’s usually everything around the transaxle linkage that craps the bed because that piece has to be so stout. The linkage falls off the shifter after the clip that attaches it comes loose or fails. Bushings at either end wear out and cause the shifter to flop back and forth. The stupid linkage comes loose on the transaxle side, causing you to have to reach your arm up in oily muck to get on top of the transaxle to fix it. But no! This one on the No. 888 Supercar just snapped in half. Perhaps it was a weak spot in a faulty part, but it’s among the most bizarre failures I’ve seen on a race car. It was a pretty clear break when Lowndes showed it on the broadcast. Supercar drivers are tough, but I never would’ve thought they were “snap large metal tubes in half” tough. It’s even worse for Lowndes, as he currently sits third in the Supercars championship behind Jamie Whincup and Shane Van Gisbergen. The No. 888's bizarre failure happened just one lap after a pit stop, moving them down from 11th to 21st place after the transaxle linkage was fixed—and seven laps down from the race leader.